To activate a lead, navigate to the Leads area using the side navigation or by clicking the icon below. Select the lead you wish to activate and click the "Convert to Customer" button in the upper-right hand corner of the lead's detail page. for more information about Leads click here. To activate a customer from their customer profile, navigate to the Customers area using the side navigation or by clicking the icon below. Choose the customer you would like to activate from the customer table and open their profile. Click the "More" menu in the upper right hand side of the profile. Choose "Activate Email." to send your customer the activation email. From this email they can activate set their password which will activate their account. They will also receive a link to download the Pet Owner's app from their appropriate app store. 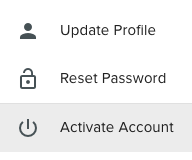 You can generate a reset password email from this menu as well.